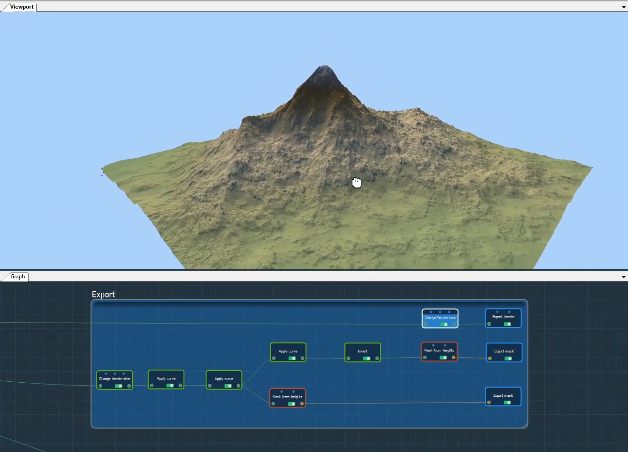 This section explains how to import your terrain into Unreal Engine. When you have completed your terrain, export it using the file format Raw16, which is the optimal format according to EPIC. In this example, we have created a simple 2048x2048 terrain. 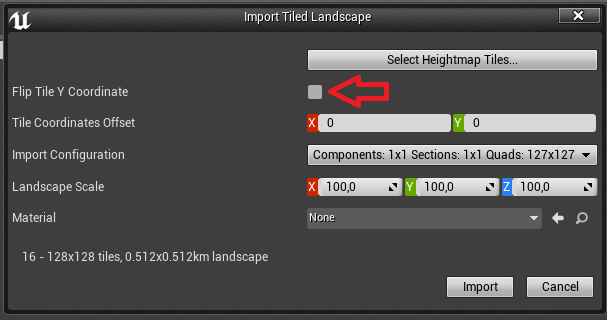 In Unreal Engine, click on the Landscape icon and import your heightmap. The data fit automatically to your file. Click on Import. The terrain imports, but the padding is untidy and the terrain looks flat. Now, we will fix this quickly. The table below lists the optimized landscape sizes recommended by EPIC, which guarantee a borderless terrain. The table is available at https://docs.unrealengine.com/latest/INT/Engine/Landscape/TechnicalGuide/. Crop the 2048x2048 terrain to a recommended resolution of 2017x2017. A height of 100 in the Z scale corresponds to a height of -256 m min. to 256 m max. Accordingly, 200 in the Z scale corresponds to a height of -512 m min. to 512 m max., 400 to a height of -1024 m min. to 1024 m max., etc. Check the min. and max. 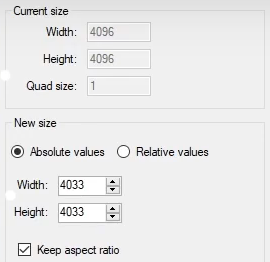 heights of the terrain and export it with a defined height to the nearest power of 2. In this example, the heights are -467.04 min. to 224.70 max., therefore, the terrain is exported with a defined height of -512 min. to 512 max. Reimport the terrain into Unreal and set the Z scale to 200. When the terrain is reimported, the landscape data fit automatically to your new heightmap resolution, according to EPIC's recommended sizes. The padding disappears and the heights appear correct. This section explains how to export your terrain as multi-files and import them into Unreal Engine. 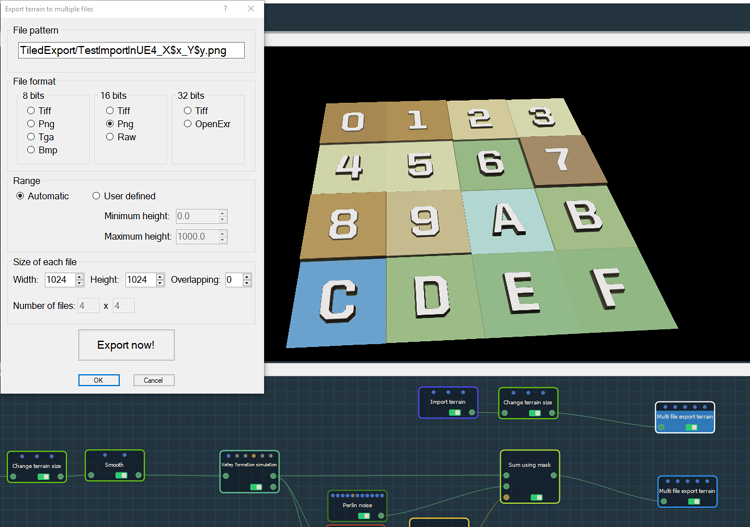 Right click in the Graph Editor and select Create Node > Export > Multi file export terrain and double click to open its parameters. 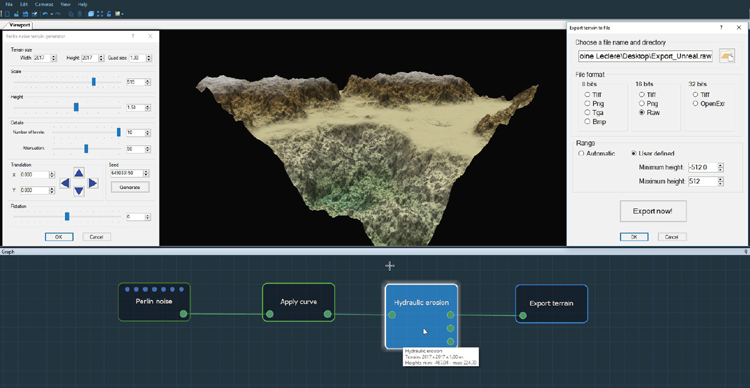 See and Multi file (tiled) export terrain node for more details. The following pattern works for UE4: "filename_X$x_Y$y.png" (UE4 requires an "X" and an "Y" before the coordinates of the tile). Note that UE4 forbids tiles of more than 1024 vertices. Be sure to check the size of your tiles. After the export is completed, you will have the following files in your Windows Explorer. Open your UE4 project, and when using the world composition import, specify if you need to flip or not the Y Coordinates. Do not check this box for Instant Terra. This option is checked by default. The terrain tiles appear in the correct order / position inside UE4.